The term Exotic Veneer applies to those wood species that grow some where in the world other than the North American continent. Most exotic veneer intended to be sold in North America is sliced from 1/48" to 1/55" but you will find a limited amount of 1/28", 1/16", 1/12" and 1/10". The Swiss do slice 1/36" in several species but they are the acception not the rule in Europe. The Chinese regularly slice and consume 1/64" but we have never had anything quite that thin in our inventory. From what I have been told the Japanese slice veneer so thin, that they have to use colored substrat at times, to avoid destorting the color of the face veneer. Feel free to advise me as to the truth of that statement. Afrormosia occurs primarily in West and Central Africa and is found mostly in the Ivory Coast, Ghana, Cameroon and Congo. This species is listed in "CITES APPEDDIX II" for material from West Africa. An in country issued export permit is required to verify that the source of the material is legal, due to its May Become Threatened status. 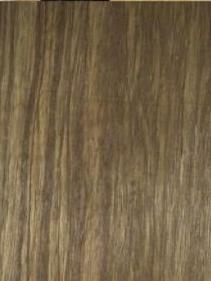 Afrormosia is a very nice decorative veneer and in some cases is used as a substitute for Teak. I do not think it mimics Teak that much and prefer to use it for its own appearance. This wood is some what brittle and it seems to alway's have knife marks in it that can take some work to get out. We have also found that it isn't always so easy to finish. It does seem to have the ability to be blotchy especially when a lighter finish is being used. So we prefer to seal coat first and lay color over that rather than stain right into the grain. We have had issues with the movement of this wood as well, mostly when it is resawn to 3/16" - 1/4". I have a tendancy to like Afrormosia when it has more of a brown tone to it. We pretty much always have some quarter cut in inventory. Wow, what can be said about Anigre, accept, how many spellings can one wood actually Have? Anegre is found primarily in Cameroon but also in Angola, Congo, Ethiopia, Ghana, Guinea Bissau, Ivory Coast, Kenya, Nigeria, Sierra Leone, Uganda and Zaire. Exportation from Cameroon is actually prohibited by local laws. This wood has been very popular for quite some time and extremely popular at various times. The most popular colors being the lighter to mid straw tones it will exibit. Anegre does have the ability to be very red and can develop blue spots at times during the drying process. Any one that has worked with Anegre knows what it can do to blades of all types, it makes them dull quickly. Timber production is in low quantities but exports are regular so even though inventorys are not as vast as they were a few years back, the wood is still available. I would look for the harvesting of this wood to become more restrictive and harder to get. It is such a good decorative species due to its pleasant neutral tone and its ability to Block Mottle, Fiddleback, Bees Wing and have very straight quarter grain to boot! We typically always have figured, plain sliced and plain quarters in our inventory. It turns out that European Ash gets used to make baseball bats too. Who would have thought? This wood grows through out Europe into Asia Minor and Caucuses. 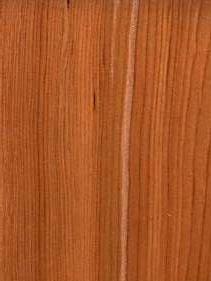 It is a fairly popular wood but we have noticed that plain and figured quarters are getting harder to come by. There seems to be a lot more olive Ash longwood available these days though. Figured quarters can be a struggle to splice at times with a longitudinal splicer especially as they get narrower, so don't put away the veneer tape. We typically have panel length quarter figured in our inventory. Avodire is used at times in just about everything including instruments, even drum sticks. 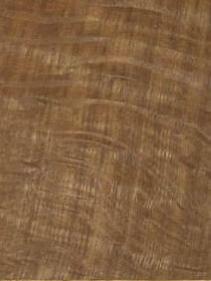 This wood is destributed in Tropical Africa and is most common in the Eastern region of Ivory Coast. Like Euro Ash, Avodire is a nice medium tone, figured architectural wood that doesn't jump off the wall at you. Which means it may not be particularly memorable but non the less very atractive. I think both woods can be used in a contemporary, modern or traditional setting without great difficulty. It seems odd to me that we do not get asked for this wood more often so we do not always keep in stock. But it's usually not to hard to find a few sequences to compare. Beech in Europe is like Oak in North America. It grows every where and gets used for just about everything. It works especially well with accent woods that have a contrasting color, like Mahogany. We pretty much always have plain sliced, plain quarter (rift) and figured in inventory. We favor steamed over unsteamed as do most of our customers. Figured sometimes has such strong character that it will display some lighter grain tones. This is a great wood that isn't that hard to work with and can be used in large doses with little consequence other than having the ability to look very clean and fresh. Birch grows around the world primarily in the Norhtern Hemisphere and at higher altitudes. There are so many types of Birch and they all seem to be capable of being figured. It seems that karelian and Masur Birch are one in the same. I am guessing that the name Masur originated in North America and that Karelian originated in Europe. If any one knows the truth to that feel free to contact me. Ice Birch, Flame Birch, Curly Birch and Karelian/Masur Birch (Birch Burl) are believed to be the result of grain deviations possibly due to the larvae of burrowing insects that create pith flecks which show as irregular dark markings and local grain disturbance. Over the years we have made many Ice Birch and karelian Birch panels,doors,component parts, fixtures and cabinets and I do not remember anything that didn't look good. As a result we pretty much always have Karelian and Ice Birch in our inventory. Bloodwood, also known as Adda, comes from Central/Latin America. Not all Bloodwoods are deep red and some arn't red at all. So far we have only worked and inventoried with what we assume to be the very red version of Adda. 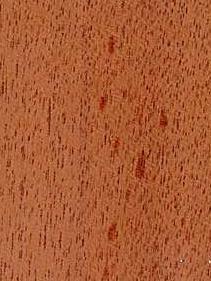 This wood is actually very pretty and I think that it holds its color well so if you like red and an attractive grain, it could be just what you are looking for. 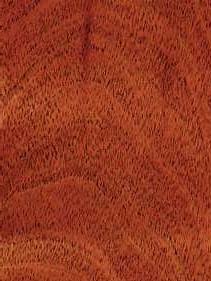 Bloodwood is dense, brittle and it can move around a bit. When we work with bloodwood we are very careful not to scare the hell out of it with to much heat or moisture. I would suggest that the first time you work with this particular wood that you take a minute to experiment with it just to get comfortable with what it may or may not do in your shop. We do try to keep some in inventory but rely on mill inventory's if we need a full sequence for a project. 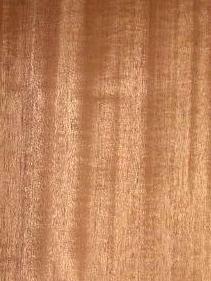 Bubinga is found in Central and North Africa (Cameroon and Gabon). There are concerns about its status but it seems to be generally secure in most of its natural habitat. It is my opinion that it won't be long before more light will be shed on its vulnerability. Kevazingo is a term reserved primarily for the rotary-cut veneers which display the exotic coloring and figure that we also know as Pommelle and Waterfall. These are large trees that yield pretty good sized plain sliced and quarterd veneer leaves. 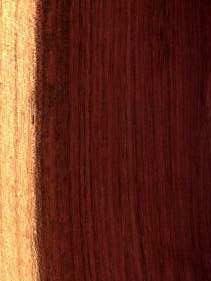 Bubinga is a great wood and for the most part it splices well and presses well. Bubinga does have some silica which has a dulling affect on knives and blades. Keep an eye on gum pockets because they can especially be a pain when splicing. This is a wood that as soon as I run into buckle we soften it or set it aside. It is tough to splice Bubinga that has any buckle. We typically have plain sliced, pommelle/waterfall/kevazingo and quarter cut in our inventory. It is written that Cedro hembra (Cedrela oderata) is the most commercially important and widely distributed species in the genus Cedrela. Interestingly enough from what I understand its neither Spanish or Cedar though. It seems that its popularity is some what limited to cigar boxes, humidor liners and the occasional architectural application in North America. But,in the American Tropics the aromatic wood is in high demand because it is naturally termite-and-rot resistant. Unfortunately its numbers are continuing to be reduced by exploitation without successful regeneration and therefore it could end up being endangered if we do not pay attention. We do have one quarter figured sequence that is very attractive and it smells good when you work with it. The resin that rises to the surface does clean up when sanded. Try it, you might like it. Cocobolo has to be one of the most beautiful woods in existance. It is also quite rare and becoming even more so due to its dwindling supply. This woods natural occurance is some what limited to begin with so as time goes on and it gets harder and harder to come by the price will just keep going up. To add insult to injury many wood workers react to the needle like crystals in its grain. Once these cystals become air born they can come in contact with your skin and or your lungs. At that point it doesn't take long to realize whether you will react or not. It is best to always wear a dust mask while sanding and machining all woods especially Cocobolo. If your skin is sensitive to Cocobolo wear a long sleeve shirt and rinse your hands off before you wipe your brow. We occasionally stock Cocobolo but due to its expense I usually acquire it as needed. Macasser Ebony comes from India, Indonesia and the Philippines. It's getting rare and really expensive! I have read that girdling for two years and then air drying for six months is the procedure that reportedly gives the best results, probobly not going to happen in any of our back yards. That doesn't make this wood any cheaper though so to get away from the expense there are some alternatives. You can use engineered Ebony and or a stained substitute. The problem is is that there really isn't anything like the real thing! Quarters continue to get narrower and a little tougher to deal with. There are several appearances afforded by this wood and one thing I have noticed over the years is that picking out a particular look becomes very personal and should. You had better like what you are about to live with. We pretty much always have some Macasser in our inventory and or we acquire what we need. I really like Figured Etimoe when it leans more to the brown side and has dark brown and black grain running through it. So when we have it in stock that is most likely what it is going to look like. For some reason this wood has just never caught on. Maybe it's the reddish version that turns people off. Don't hesitate to check with us because we may have some or I may know where to get it. I just do not know what to say about Eucalyptus accept that we usually have some figured red and white in our inventory. If this wood has any buckle, which shows up more like what I call puckle, it can be hard to splice. Most Eucalyptus chips easily and sometimes doesn't appreciate being heated up to 275 degrees to be spliced. For the most part it isn't to bad to work with. This stuff grows all over the world. Example: Argentina, Australia, New Zealand, Tanzania, Brazil, Chile, Ethiopia, Hawaii, India, South Africa, United States, Spain, Portugal, France, Algeria, Kenya, Madagascar, Uganda, Congo, Malaysia, Zambia, Nigeria and Sri Lanka. Oh yea, a few of the several species of Eucalyptus are plantation grown. One of them is commercially known as Lyptus. Personally I like the deep red figured Eucalyptus but I think the white figured is easier to have around in any kind of decorative quantity. European Sycamore, Sycamore Plane, European Maple or whatever you want to call this beautiful wood, unlike North American Maples, can be lustrous almost to the point of being iridescent. Keep in mind that it will eventually darken to a light golden brown. We do sell it as a substitute for holly. From what I understand, Great Britain is the largest single supplier of Sycamore. Harewood is Sycamore that has been dyed a silver-gray color. The dye is forced into the wood by the use of hydraulic pressure and, voila, you have Harewood! Sycamore was very popular for several years but lately it has taken a back seat to darker woods. 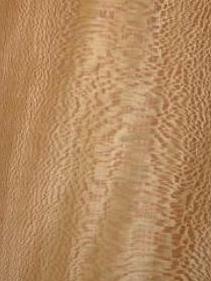 We usually have plain sliced, plain quartered and/ or figured Sycamore in our inventory. 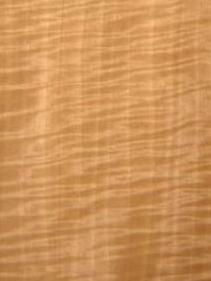 Goncalo alves is a Latin American wood that at times could be considered a zebra substitute or a Rosewood or just be Goncalo alves. As you can imagine it does get used in a number of decorative applications such as billiard cue butts and decorative veneer panels. We rarely get asked for Goncalo alves and when we do, it is usually in small doses, so we don't keep it in stock on a regular basis but there always seems to be some around so don't hesitate to ask us about it. Iroko grows in many areas of Africa that are dry. 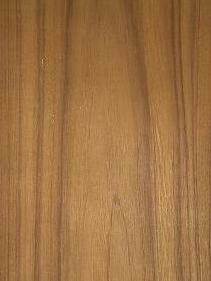 It has a great many uses besides decorative veneer and at times gets used as a substitute for Teak. 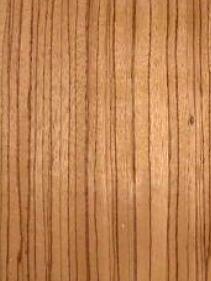 This is another wood that some people have allergic reactions to. I have never reacted to it myself but then we rarely work with it. I have a few pieces of lumber that should be acclimated by now since I have had them for years. To this day if I leave any of it out on saw horses or a table, you can pull up a chair, grab a beer and watch it move. That doesn't help my confidence in this wood. Especially if I know that we may have to put solid edges on some cut to size cabinet door panels. I won't say we do not stock this wood but I will say that we don't have it around very often. Again there usually is some available though. How many names do you think Jatoba could possibly have? If you were to say over 200, you would be right! 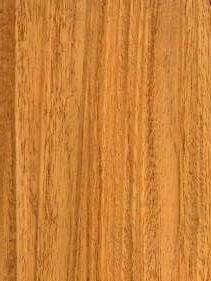 In veneer form we know Jatoba as Jatoba and Courbaril. In flooring we hear about it being called Brazilian Cherry. You may know it as Stinky-Toe. 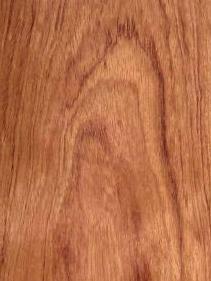 This particular wood and its cousin Baracara are found in Central/Latin America, Oceania and SE Asia. Jatoba is durable, which is proven I suppose by its use as flooring and railroad ties. 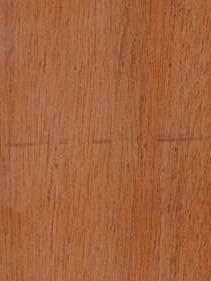 Jatoba can also be attractive enough to be used in an architectural setting also. We use lower grades of Jatoba as backer for woods like Macasser Ebony and Wenge and better grades for architectural panels. We typically have a couple grades in inventory but prefer to show mill samples to projects that require a fair amount due to the variety of appearances and grades that may available. Not many names for this wood and it only comes from Brazil. 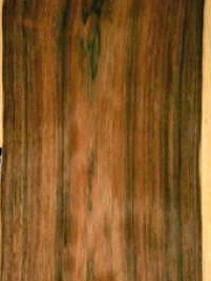 Goncalo alves is sometimes referred to as Kingwood. We do not stock Kingwood on a regular basis but there always seems to be some around. Kingwood is pretty dramatic stuff but keep in mind that panel length veneer is usually not abundent. This basically means that if you are trying to construct a long wall sequence, you most likely will need to plan way ahead in order to find enough veneer. 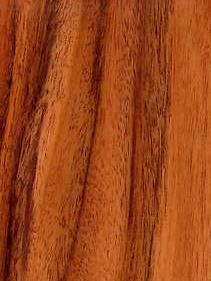 Koa, the wood of the island gods that only has one name, Koa, is also exclusive to the Hawaiian islands. It grows at most elevations on the islands, but supposedly grows best in areas of heavy rain fall at elevations from 3000' to 6000'. The classic Koa look of rich red, brown, black and white is getting pretty hard to get and when it does pop up, hang on to your wallet. A lot of the Koa that is available these days is lighter in tone and may be plain or figured but just doesn't have a lot of color. Don't get me wrong there still are some nice sequences from time to time but fewer and farther apart. We like to keep some Koa around but prefer to keep in touch with suppliers who can provide us with options. 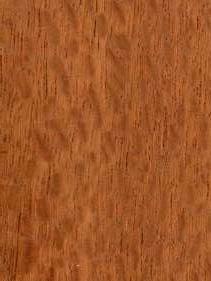 Australian Lacewood is a little different than South American Lacewood but not hugely. European Plane Tree and North American Sycamore are also called lacewoods and they can have a similar appearance at times but are actually very different woods. The Lacewoods that we are most familiar with are coming from Australia and South America. If there is one thing I tell people about lacewood it's to get ready for a healthy waste factor. We have never been asked for Lacewood with anything larger than medium eye and the nature of the beast is not to have just small to medium eye. We don't even use the honey comb for backer because its just not productive and I have never meet anyone that likes it enough to want it. We have made lots of panels and cut to size cabinet parts so we always have some Lacewood in inventory. Limba in general is relatively secure with little or no threat to its population within its natural growth range. It grows in both rain and savannah forests and in plantations in West Africa. One of the down sides to Limba is that it doesn't have much resistance to termites and heartwood decay so it is susceptible to a condition called brittleheart. Basically what that translates to is that the wood is weak and rarely used in structural applications. We typically have both black and white Limba. If you are not sure what Limba really looks like stop in at a Tully's coffee shop, they have been using it as decorative veneer in their cabinetry for quite a long time. 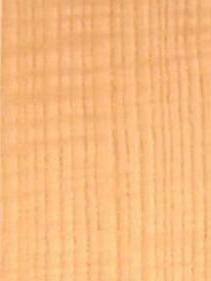 I have a tendancy to favor white Limba that has some block mottle figure in it. 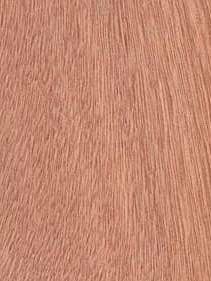 African Khaya Mahogany veneer has pretty much replaced South American Mahogany in the North American commodity Mahogany panel world. The general concensus seems to be that despite being vulnerable there is little threat to its survival, at least in the immediate future. There are exceptions but they are the acception at this point not the rule. 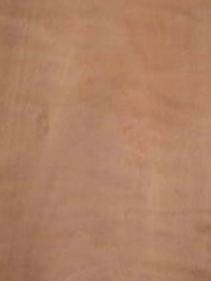 Ok heres the deal with African Mahogany. 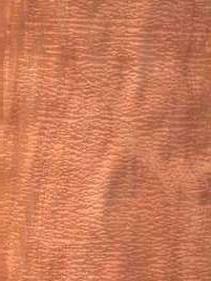 There are five species of Khaya Mahogany: grandifoliola, anthotheca, ivorensis, nyassica and senegalensis. Ivorensis is not only resposible for producing most of the swirl and crotch, it also counts for most of the African Mahogany production in general. Despite that, it is usually sold in a mixture with the four other Khaya species. The darkest and heaviest of the five is grandifoliola which you are more likely to find as lumber not panels due to its darker color and weight. 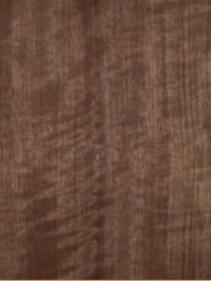 The yellowish brown color that is present in the paler shades of American Mahogany is very rare in the khaya variety's. In general Khaya can have plenty of tension wood in it which can be caused by brittle-heart or soft-heart and most of the species are not great for steam bending. We have more problems splicing plain sliced than quarter ribbon. When we work with crotch we alway's soften and flatten the leaves first. 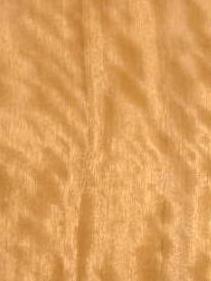 Khaya displays more ribbon grain typically than American Mahogany. 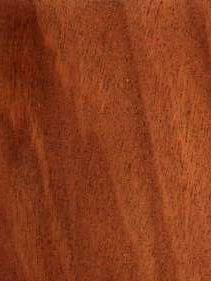 We pretty much always have plain sliced, quarter cut and crotch Khaya Mahogany in our inventory. What do you say about Swietenia Macrophylla other than it is perhaps the most valuable timber tree in the whole of Tropical Latin America. It is now widely planted throughout the whole of the tropics as a forest crop and currently provides almost all the Mahogany on the commercial market, but, that doesn't mean that while it is relatively secure in some countries that it isn't either Extinct, Endangered, Vulnerable or Rare in others. Currently the species is vulnerable in Nicaragua, Rare in Colombia, and endangered within its natural boundaries in Guatemala and seven regions of Brazil. All species of Swietenia are CITIES Appendix II listed. Appendix II species are not necessarily threatened with extinction but may become so unless trade is subject to strict regulation in order to avoid utilization incompatible with their survival. We do currently have some plain sliced and quarter cut 1/42" and 1/10" inventory that came from pre CITIES exports. I suspect that any new stock we bring in in the future will be FSC certified. Makore in my opinion is one of the most elegant woods on the planet and who can argue with that knowing all the different grain patterns these trees have to offer. I think Makores source forest's are in a vulnerable state and I am in favor of this wood being protected and sustained for future generations to enjoy. I think that Moabi, which is a look a like substitute for Makore, should be protected as well. I love working with this wood despite its blunting and mild toxic affects, it just looks so beautiful when finished. We have plain quarters, block mottled, pommelle and a small amount of fiddleback in inventory. Wear a dust mask when machining and sanding Makore because it is known for its ability to irritate the nasal passage. Ok here is the deal with European Oak. It is native to Europe, Northern Africa, and Western Asia, and is more abundent in France, Poland, Yugoslavia, and the Baltic Countries. It is the most common forest tree in Great Britain, especially Wales, and is found in stands and mixed forests where it can often be the dominent species. English Brown Oak is the product of trees that have been stained brown by the beef-steak fungus (Fistulina hepatica). Supposedly the fungus is killed during the seasoning process. Bog Oak is exactly what it sounds like. European Oak that is buried in peat bogs for centuries under goes a chemical change and before you know it you have bog Oak. Fumed Oak takes on a weathered appearance when Oak is exposed to ammonia fumes in an air-tight compartment. From what I understand the more you fume it the darker it gets. This isn't something new. Gustav Stickley's original woark was made of quartersawn white oak and fumed. It is also marketed as pickled Oak. Oaks native to the United States are typically substituted for the common type of English Oak since they have the same uses. Most often the European Oaks coming into the North American market show up as Fumed Oak (Pickled Oak), Bog Oak and Brown Oak. We keep Brown Oak in our inventory but so far we only bring in Fumed Oak and Bog as needed. 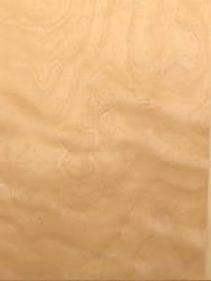 Okoume (Gaboon) is used heavily in the plywood and veneer industry. We use rotary Okoume veneer as backer, for cross banding, and as platform material for custom plywood production. We prefer to use Okoume when we are creating curved panels. Okoume comes from the Congo, Equatorial Guinea and Gabon. This species could easily become Endangered if adverse enviromental practices persist. Because we like this wood so much and use it for so many applications we are very careful with it and try to waste as little as possible. We do inventory rotary Okoume and bring plain sliced in on a custom basis. 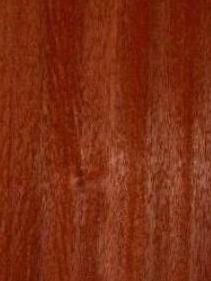 Padauk is primarily found in Central and Tropical West Africa. It typically grows in small groups and is common in dense equatorial rain forests. 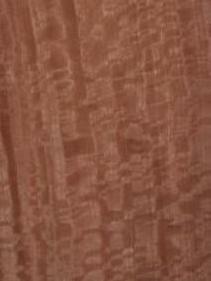 Padauk is exported in low quantities and only occasionally. From what I have read it is abundent within in its range but vulnerable in parts of its natural habitat. 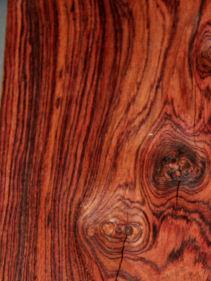 We typically have quarter cut Padauk in our inventory but we do not get many requests for it. We have actually built some faiirly large panel orders for this wood but they seem to be few and far between. I think the color is very unusual and attractive but not most folks cup of tea. This is one of those woods that look great but to much of a good thing can some times spoil the party. Paldao is primarily found in China, India, Indonesia, Malaysia, Papau New Guinea, Philippines and Vietnam. There doesn't seem to be a ton of information about its status. It appears generally secure within most of its habitat but there are some exceptions of concern. It is reported to be rarely harvested in some of its habitat because most of it is made up of sapwood (30 to 40 percent). Another reason has to do with the large buttresses that are common to this species making it difficult to harvest without building platforms to do so. Last but not least local woodsmen believe the large buttresses harbor evil spirits and therefore are reluctant to touch the trees. It seems that whenever we have an inquiry about Paldao, which isn't very often, its for veneer that desplays more grey and sap tones rather than brown and black. So that is what we will typically have in our inventory. Pearwood is found in Eastern and Western Europe, North America, Oceania and SE Asia. The Primary countries of destribution are France, Germany, United Kingdom and the United States. There seems to be plenty of it and no one seems to be saying anything to the contrary. The best Pearwood comes from Germany and France. Supplies are limited since the tree is valued for its fruits, and only old trees are harvested for timber production, much of which exports to the European market place. Veneers are the main form of Pearwood imported into the United States and it is expensive. Domestic supplies in the US are scarse and are usually of poor quality. We do have Pearwood in our inventory, mostly quarter figured and lumber. 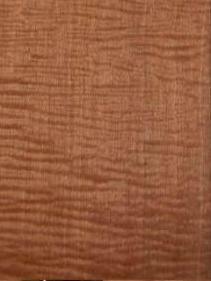 It is hard to find plain Pearwood veneer in North America so expect at least a little figure. European Plane and Planetree are not the same wood. Planetree is also called Sycamore/European Maple. European Plane is much like North American Sycamore. The natural growth range of European Plane in Europe includes the United Kingdom, France, Spain, Italy and the surrounding countries. This wood is highly tolerant of poor growing conditions which enables it to grow in large cities like London. 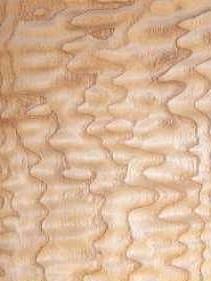 Plain European Plane and Lacewood (obtained from highly figured, quartered Plane) are often chemically treated to produce a form of Harewood. 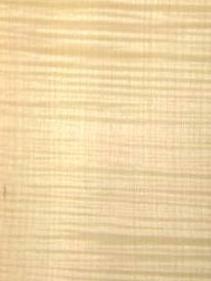 The term Lacewood applies to quarter sawn Plane timber only. We usually do not stock Plane because we stock domestic Sycamore which looks a lot like it. We have had it in our inventory in the past and do bring it in upon request. Primavera is often referred to as " White Mahogany" in the US. The geographical distribution of Primavera includes Central America, Mexico, Nicaragua and Guatamala. Most of the material in the US market is believed to come from Guatamala where the law requires the primavera logs to be processed and exported in lumber and veneer forms only. 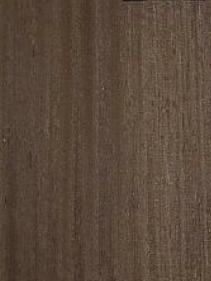 Some think that Primavera has a similar appearance as Ceylon Satin wood. I haven't seen that resemblance yet. Ceylon Satinwood appears to have much more of a lustrous gold tone to me. Primavera does have an interesting array of appearances though like ribbon, block mottle, rain drop and fiddle-back. There isn't an over abundance of veneer in the country but lumber inventory's are uasually pretty good. Very little Primavera is exported to Europe. An interesting fact is that it is recommended that Primavera be harvested in 'the dark of the moon', since unlike trees in the temperate regions, the sap rises and falls with the phases of the moon instead of in winter and spring in the region that Primavera grows. We do have a nice sequence of Primavera in our inventory and it is panel length. The commercial name Purpleheart refers to timber produced by about 20 species, which grow in Central America and Tropical South America. Supplies are ample, but the wood is rated as vulnerable. Despite not having found wide demand, Purpleheart is available on the US market in both lumber and and veneer forms. Purpleheart isn't super expensive it costs more than Mahogany but less than Teak. 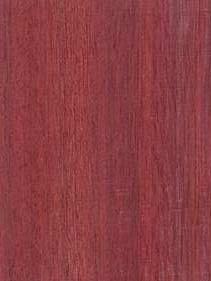 Purpleheart is one of those woods that seem to be sold more in lumber form than veneer. Believe it or not I read that if you treat the wood with Armorall before applying lacquer, it will hold its color longer. 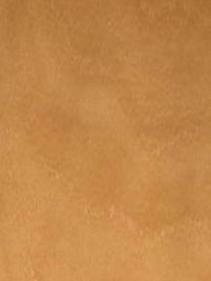 I also read that the use of water based finishes apposed to spirit based finishes helps hold color as well. We typically have some veneer and lumber in inventory. Most of the orders we receive for Purpleheart are small because it's going to be used as an accent wood rather than the dominent species. Its pretty wild looking at a 4x8 Purpleheart panel though. Brazilian Rosewood comes from Brazil. Most common other names it is known by, Palisander, Rio and Jacaranda. 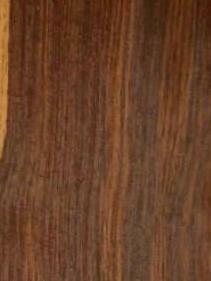 This wood is now CITIES I listed and as most know it is very hard to get really nice Brazilian Rosewood. Exportation of Barzilian Rosewood into the United States has been prohibited since its cutting ban in 1992. Any inventory that comes into this country has to have been cut before the ban. We have had it in inventory and we still have it occasionally. I do not like to buy this wood unless it has that classic Brazilian look with a well defined cathedral heart, quarters and not to much sap. Most of what we see these days is kind of wild. Usually we bring it in for a project and use pretty much all of it. At any rate it is getting hard to find but there is some around and yea never know it might work for your project. Check with me and I will let you know what I know. When seasoned East Indian Rosewood is said to be two-and-one-half-times as hard as Oak, stronger and stiffer, just a heck of a lot more expensive so you might think twice about replacing your shovel handle with it. Anothet piont of interest, those occasional chaulky white deposits can blunt your cutters. Who else has noticed the faux Indian Rosewoods that are showing up in inventorys around the country. Personally I like the dark wood better. Perhaps this is the result of the introduction of Indian Roasewood to country's like Burma, Nepal, Srilanka, Kenya and Nigeria or just the pressure being put on the demand for the true Indian Rosewood that grows in India and on the island of Lava in Indonesia. We usually have Indian Rosewood in inventory, the dark stuff. 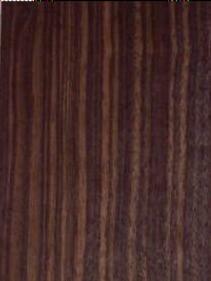 Santos Rosewood, despite being a substitute for Brazilian/Rio Rosewood, is not a true Dalbergia. Brazil and Bolivia are the major suppliers of Santos. It is also known as Cavinua, Jacaranda pardo, Pau Ferro, Morado and several others. Some of these names are also used to describe other species as well. Both Rio and Santos Rosewoods are hard and oily. They require a little extra care before gluing and finishing like Teak. Santos is beautiful but sequences are typically smaller and colors are not consistant from one flitch to the next. We pretty much always have some around but I prefer to pull mill samples for projects that require at least one sequence. That way you get to pick the look that works for you. There is a chance that we might have what you are after especially if you are looking for a small quantity. So check with us and lets see what we can do to help you. 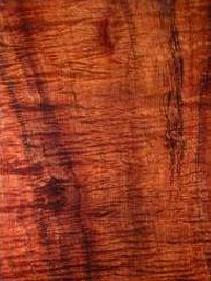 Santos Mahogany, which I prefer to call Cabreuva, is not a true mahogany. Most of it markets from Bolivia and Peru but its range stretch's from Southern Mexico through Central America to Argentina. It is considered extinct, endangered, vulnerable or rare in Costa Rico. Anybody that has worked with Cabreuva knows how heavy and hard and difficult to work with it is. But on the bright side of things it smells good the only other problem is that it may cause respiratory irritation for some folks. This wood isn't produced in the quantity's like SA Mahogany or Santos and you may actually see larger lumber inventorys than you will veneer. We occasionally get a request for Santos Mahogany but not very often, therefore we do not always have it in our inventory but that doesn't mean that we can't find some for you. 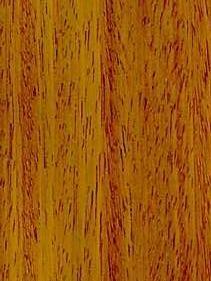 Quarter cut Sapele can yeild an amazing straight and prominent ribbon grain that in my opinion is unriveled. Pommelle and fiddleback Sapele can at times look much like Makore and be equally spectacular. I personally like to work with Sapele veneer and lumber. The wood in general machines and splices well, looks great and leaves a lingering Cedar like smell well after it has been machined. It ranges from the Ivory Coast to the Cameroons and eastward through Zaire to Uganda (including Ghana). Unfortunately this species is vulnerable in Cameroon and the Ivory Coast and it is also being considered as a candidate for an enviromental status assessment in Ghana and Uganda. We usually have some ribbon, fiddleback and pommelle in our inventory but if not I will find some. Ceylon is also called Burutu and Sengel and comes from India, Pakistan and Sri Lanka. It is hard to believe that this wood could be used for anything other than decorative applications but in reality it even gets used for wheel spokes. This is a species that produces several attractive patterns which include mottle, roey and ribbon, broken stripe, bee's wing and cross mottle. You won't see a lot of this wood in lumber form. We do keep some in stock at times but it can get very brittle when stored for long periods of time. You have to be careful that it doesn't dry out to much. 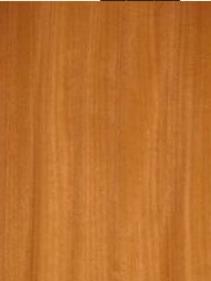 Ayan (African Satinwood) is also called Movingui and Nigerian Satinwood. This is another one of those really pretty woods that gets used for railroad ties if there's nothing decorative to do with it. Most of the production of this particular wood comes from Cameroon, Ghana and Nigeria. One thing about Satinwoods in general is that they all seem to have a fair amount of silica and African Satinwood is no different and maybe worse. A silica content of .05% is considered high and this wood can actually get up as high as 1.3%. How long do you think you can hold an edge under those conditions? Movingui is produced in fairly low volumes so there may not be a ton of it around on a regular basis. We have had it and do have it from time to time but not on a regular basis. There is another African wood by the name of Amani Satinwood which you guessed it is also called East African Satinwood. Which must be because it comes from Tanzania? So last but not least there is a wood called Brazilian Satinwood or Pau Amarello, Boxwood, Canarywood and it does come from Brazil. Actually it grows exclusively in the dry land areas of Brazils Para State, in the lower Amazon and we all know right where that is. I have never worked with this particular wood and I would like to hear about it from any one that has. Ok last but not least the real deal is suppose to be West Indian Satinwood which comes from the Americas but is extremely rare. I have never seen it nor do I know anyone alse that has either. So again I would really like to know what it is like to work with or see a pictuire of it as a piece of furnitue or a sample of veneer or lumber. So obviously we do not have any in our inventory. Tamo Ash, also known as, Japanese Ash, which is not to be confused with " Sen " which is also called Japanese Ash which, unlike tamo, is not actually an Ash. Tamo comes from Southeast Asia especially Japan. This wood can really pop when it is rotary cut. It is pretty unlikely that you will ever find much tamo lumber but there seems to be an ample supply of veneer. We usually have some in inventory but with the renewed interest in dark woods we have noticed that it hasn't been overly popular lately. That doesn't mean that it isn't beautiful, its just not everyones cup of tea right now. What can be said about Burmese Teak accept, has anybody purchased Teak lumber lately? If that isn't an eye opener I do not know what the heck is! Maybe if the Myanmar Military Regime concentrated more on forestry and the benefits they and the people of Burma might realize by establishing Teak plantations and less on the "heroin trade", they might actually begin to be recognized as a legitimate governing body and really good Teak wouldn't be so hard to come by. Fortunately, the people of Burma have perhaps the best Teak on the planet. Unfortunately, the junta most likely reaps the benefits of its popularity. Despite the fact that Teak is indigenous to India, Thailand, Java, Indochina and Burma the most popular in the US is Burmese. Its uses here in the states seems to be limited to decorative and the boat building trades so we do not consume much in comparison to many other species. I have read that plantation Teak trees reportedly get up to 150 feet (45m) in height and they can be ready for harvest in 60 years. If you can't wait that long or it's just too expensive you can try Afrormosia, Kindal, Iroko, Freijo or Ltauba as a substitute. We can help you with Afrormosia, Iroko and Teak. 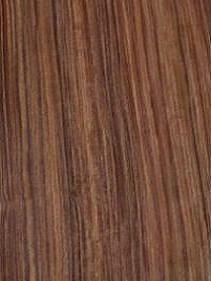 The natural growth range of Wenge is the open forests of Zaire, Cameroon, Gabon, The Southern regions Tanzania and Mozmbique. On the other end of the spectrum, it can also be found in the swampy forests of the Congo. Wenge is more of a dark brown with black grain woven in for good measure and it does lighten up when exposed to the sun. From what I understand, importers will sometimes request that it purposely be left out in the sun to lighten up before exportation. Something I find interesting is that Wenge logs do not always have great yields primarily because of the susceptability that the species has to worm infestation. Couple this with various supply problems from sources in Africa and you have a wood that isn't always in great supply despite the level its demand may be at. In the US it's used primarily for Architectural purposes. In other parts of the world it may get used for spokes. We typically have quarters and a little flat cut in inventory. I really like to show mill samples for projects that may require a fair amount of veneer because, surprisingly enough, this wood can look very different from one flitch to the next. European Yew, more commonly known as common Yew, grows pretty much all over Europe, the Mediterranean, Oceania, SE Asia and North Africa. This species is actually poisonous to humans and cattle, but not to deer and rabbits. I was unable to find out what other critters can or cannot eat it. Yew starts out as bright tan and or red brown to purple but with exposure and age it will mellow to a brown/golden brown. Yew trees are some of the oldest in Europe. They are often disfigured, short and they have hollowed and fluted trunks. Waste is the word for this wood so it is a good thing there is a lot of it. The waste factor is high when processed from log to lumber or veneer and it continues from there. This wood is brittle and it cracks easily so plan on taking extra care and preparation time when working with it. Don't get in a hurry and keep some softener around. We usually only bring it in in larger quantitys as needed. 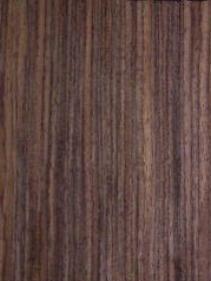 Zebrawood, Zebrano, Amouk or stinky wood is found in Cameroon, Congo, Equatorial Guinea and Gabon. This species is quite often very hard to get to and the trees are very large. To make things even more difficult it really only looks good when quarter cut, so it takes longer to produce once the logs make it to the mill. Zebrawood trees often suffer damage in the form of internal fractures which remain hidden until logs are processed. The evidence to this phenomena is very easy to spot in both veneer and lumber because the wood looks like it has a rip in it, and in reality, it does. 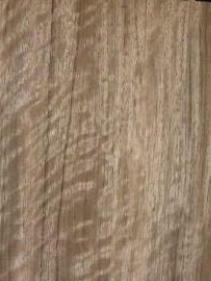 A bright side to Zebrawood is that from what I have read there is little or no threat to its existance. I do not know what everyone else thinks but I think it smells like donkey poop! We always seem to have some Zebrawood. 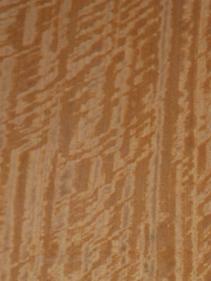 Just when it appears that we may never make anything with Zebrawood again, someone calls and asks for several panels.